So you’ve decided to stop lurking and join us? Wonderful!!! We are glad to have you. We hope that the new system that we’ve put into place will allow you to participate in all the functions of the Walker Treasury Project without having to wait on us. We also hope these quick tutorials will allow you to understand how to use the new stitch claiming system without too many problems. First, read How to Search for a Pattern below, which will give you a brief overview of how to find the available patterns. If you’ve found a pattern that’s available and you want to knit it for us, please sign up for a WordPress account if you don’t have one already. Don’t worry, you don’t have to set up a blog on WordPress if you don’t want – select the ‘just a username please’ option instead. Important – please make a note of the email address you use when you sign up to WordPress. You may also wish to sign up for a Flickr account if you don’t already have one. We recommend Flickr for hosting pictures of your beautifully knitted swatches. Then read Joining the Walker Treasury Project. This will give you a brief overview of how to register for the project so that you can claim swatches. 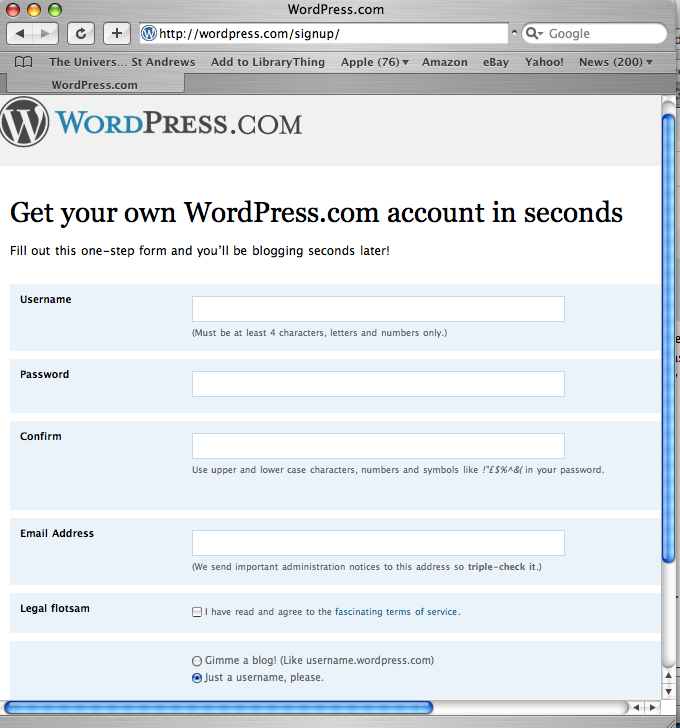 Please use the same email that you used when signing up for WordPress. The bit you were waiting for – knit a good sized swatch, block it and take photos, then post your fantastic work to the Walker Treasury Project blog. Please refer to the rules page for more info on yarn choice, knitting your swatch, taking photos, photo hosting and posting your swatch. 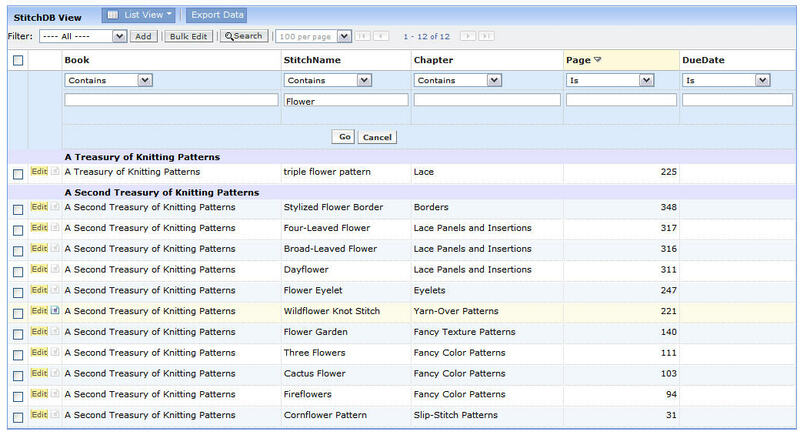 Last but by no means least How to Mark a Pattern as Complete lets you know how to confirm your swatch is finished in the Pattern Database. As always, if you have any problems, feel free to email us at walkertreasuryproject@gmail.com. On the Home page, scroll down to “Important Stuff”. 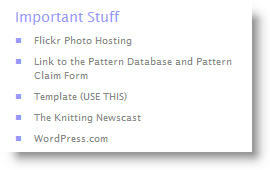 Click on “Link to the Pattern Database and Pattern Claim Form.” This form will open another page. 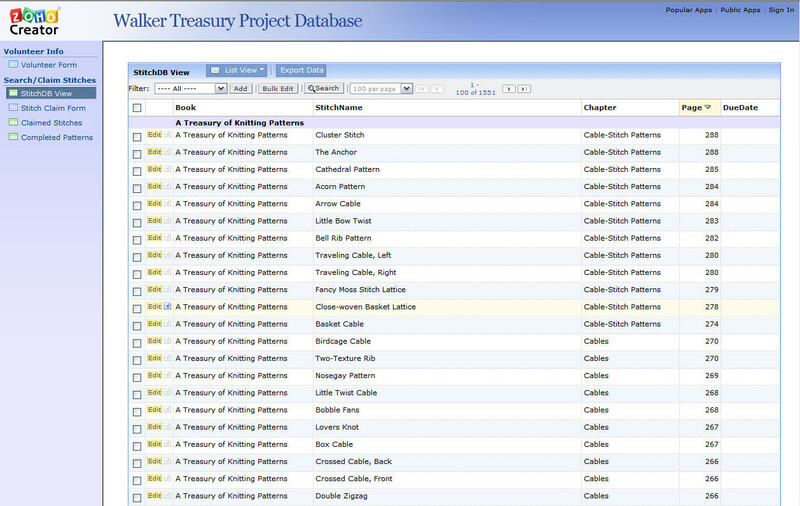 Each Book and each chapter within each book is automatically a filter. There is also one custom filter, Patterns due within the next week. Let’s say you only want to knit Cables. In order to search for all available Cable patterns, click on the drop-down menu next to Filter. All the available Cable Patterns for all the books will appear, in order of the book. 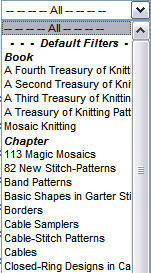 You can also filter by book (as shown) if you would rather find available patterns book by book. Perhaps you are looking for a lace pattern with flowers in the name. Click on Search on the Zoho Toolbar. In the Stitch Name Field, type in Flower and click Go. The Results will appear below. Continue searching until you find a pattern that you really really want to knit.